The amusement park called Dreamville had closed in the late 1960’s, and had perhaps been in its heyday in the 1940’s and 1950’s. Strangely, it had been built on the grounds of what had once been a graveyard; most of the graves had been relocated elsewhere, although a few had never been found, a fact which hadn’t stopped the park’s developers. Following the closure of the park, marketable items had been sold off, leaving behind the shells of game and refreshment stands and the metallic skeletons of carnival rides of an earlier generation. While there was a protective gate and chain link fence surrounding the grounds, resourceful vandals had long since scaled it, and further trashed the remaining structures. Having heard my father talk about Dreamville and working as a journalist for the Herald, an area newspaper, I sought to visit the deserted site for inspiration for an article on its past glories. I found entrance through a trampled section of the neglected fence, and began to traverse the lonely grounds. Weeds had run riot over the long neglected land, and the vandals had spray-painted assorted obscene and gang related graffiti wherever available surfaces could be found. A mournful wind brought a chill with the coming dusk, and I withdrew a small flashlight from my pocket as I prepared to investigate surviving buildings further. Approaching, I noticed that the door was secured by an ancient padlock hanging on a slender rusted hasp. The door had remained secure from violation over the many years, but its integrity had apparently not been tested recently. Holding the lock in my hands, I gave it a tug. The lock held firm, but the heavily-rusted hasp gave way, giving me access to the entrance. The hinges of the door groaned slightly as I slowly swung it open, training the beam of my flashlight inside and then entering with some trepidation. The interior of the mascot’s locker was a time capsule whose contents had remained untouched since the time of the park’s closing decades before. Mascot costumes hung on hooks attached to the wall, although some were in rumpled piles on the floor, unceremoniously dumped there when the fabric supporting their placement rotted and could no longer sustain the costume’s weight. The colors of the costumes had also changed as the dyes they were colored with had deteriorated; they were never intended to be the freakish hues that they were now. …and freed by the movement, a human skull slipped through the neck opening, brushed against the side of my body, and thunked to the floor, the jaw detaching upon impact and skating sway several feet further. I screamed and dropped my flashlight, which clattered to the floor and went out upon impact. Panicking and with madness dancing in my brain, I dropped the lion suit and went to my knees, groping in complete darkness with my hands for the flashlight. Surely it could not have gone far…at last, my fingers closed on the metallic cylindrical shape of the flashlight. I pounded its sides to restore the connection, and finally a dim beam again shown forth from it. The beam fell upon the skull, its empty eye sockets staring directly into mine. I gasped, and sprung to my feet. My breathing ragged, I began to step slowly backwards towards the door, seeking to escape the insanity that I had found. I focused the beam of my flashlight higher, and saw something impossible happening.- -One of the mascot costumes was slowly arising from the floor! The form swelled up gradually, as if being inflated from within. Once it had assumed full height and shape, the figure appeared to move almost imperceptibly, as if breathing. I was looking at a human-sized raccoon, one which regarded me as intently as I did it. I stood transfixed by the sight. The raccoon, now fully human height, cocked its head slightly at me. A grating sound came from within the figure, the rasping of vocal organs attempting to speak which had long been silenced. After making some guttural, inhuman sounds, the presence before me began to produce recognizable speech. “Do you want to see me remove my head?,” the thing croaked. 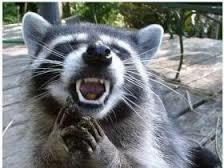 Although I instantly and vigorously began to shake my head in the negative, the raccoon dug its claws deeply into its neck and begin to tear. There was a rending sound of rotten cloth and artificial fur tearing apart, together with a more disturbing, unnatural sound of flesh or what may have once been flesh being ripped and torn asunder. I gasped and willed my legs to move, but they seemed frozen, riveted in place by the horrible sight that was before me. Worst of all was the blood that was welling out of the wounds that the inhuman thing was inflicting upon itself. The blood, so much of it was flowing…and in the weakening beam of my flashlight, it appeared thick and almost black in color! My legs finally responded to my mental command to flee, and I wheeled about and made for the locker room’s exit. I hastily rushed through the portal and slammed the rusting metal door closed. I then continued to run, my legs pumping and my heart pounding until I had retraced my earlier steps and exited the outer perimeter of the park. I did not look back, throwing myself behind the wheel of my car and spinning my wheels in my haste to get away from this portal of hell… Dreamville was a nightmare.